Goran Ostojić Vid, academic painter and professor, graduated from the Faculty of Fine Arts in Belgrade. He is the founder of the artistic literary musical genre - Classic Interactive Art, which includes the copyright protected concept of synthesis of different approaches and represents an innovative synthesis that provides the basis for the formation of a new department for studies at faculties of art. Ostojic has realized 3D classical interactive intermedia works of art. He has organized a large number of art projects, colonies, group and solo exhibitions. He is the author of publications, art criticism, creative workshops for all ages, art therapies, performances, books dealing with the theme of the original author's synthesis of contemporary art and science. He is engaged in scientific research to develop creative potentials in observers, to harmonize biochemical processes in the human organism and to advance teaching through educationally innovative interactive methodological techniques. He was a participant in many cultural manifestations and international colonies. He had exhibitions in Germany, Italy, Brazil, United States of America, Greece , Slovenia, Hungary, Bosnia and Herzegovina, Croatia, Macedonia and Serbia. 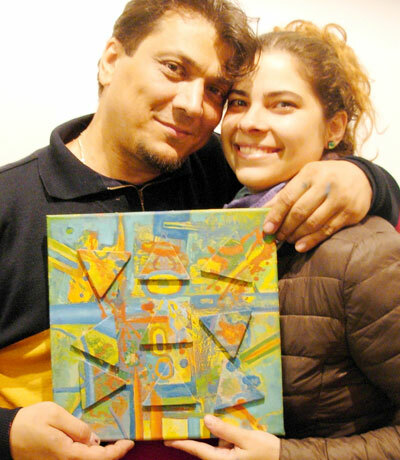 He is the former president of the ULUS painting section, employed as an independent artist. He lives and works on the route Germany-Italy-Serbia. 2017 Prima volta in Italia / For the first time in Italy and the EU, a classical interactive exhibition called PUBBLICO AVANGARDE CREATORE was organized - a song by avant-garde creator in cooperation with co-author academic painter Julija Petrovic. Julija Petrovic graduated with a Masters degree in Art at the International University in Nis. She has exhibited works in various art events and group exhibitions in Japan, Italy, Germany, Croatia, Macedonia, Turkey and Serbia. She has been a participant in international art colonies. She has had several solo exhibitions and is a member of ULUS. In the field of artistic research, she realized artistic works that open the possibility for the audience to participate in the creative process. In cooperation with the author of this concept Goran Ostojic Vid she significantly contributes to the development of a new artistic direction of Classical Interactive Art as the co-author of the whole concept. Their collaborative works are in museums and private collections around the world.